Jerusalem In My Heart (JIMH) is a project of contemporary Arabic and electronic music interwoven with 16mm film projections and light-based (de)constructions of space, exploring a relationship between music, visuals, projections and audience. 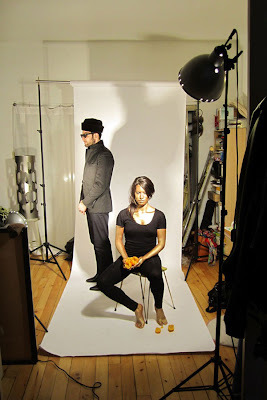 With performances thus far occurring once or twice a year, no two JIMH events have ever been the same: configurations have ranged from solo to 35 participants, with varying degrees of stage theatrics alongside a film & visual component, using multiple projections to construct a space in constant flux. JIMH's vocals and purposefully blown-out sonic sensibility have been the consistent thread, but neither its music nor visual propositions have ever repeated themselves – one of the reasons why JIMH has resisted for eight years any official documentation or definitive recording of the project. JIMH was formed in 2005 by Radwan Ghazi Moumneh, a Lebanese national who has spent a large part of his adult life in Quebec and has been a fixture of the Montreal independent music community, from his early days in various notable 90s punk bands to his tireless activities over the last decade as a sound engineer, producer and co-owner of Montreal’s Hotel2Tango recording studio. Moumneh is also active in the Beirut experimental music scene, where he spends a few months every year. JIMH now consists of a core trio with French musician & producer Jérémie Regnier and Chilean visual artist & filmmaker Malena Szlam Salazar, whose two-year collaboration with Moumneh has resulted in the co-creation of JIMH’s debut album Mo7it Al-Mo7it. JIMH forges a modern experimental Arabic music by wedding melismatic singing in classic Arabic styles and electronic compositions with contemporary electronic production. The album equally emphasizes the intimacy and narrative pace that focused, intentional studio recording allows. The result is a unique and profoundly emotive album of contemporary Arabic music, a stunningly subtle first record for a project that resisted documentation or any sort of fixity for so many years. Moumneh's voice has become a powerfully authentic instrument, and his production techniques applying distortion, tape echos and delays to varying degrees transmit a timeless intensity to the recording. Saturated synths and the overdriven signals of Moumneh's acoustic buzuk and zurna reinforce the reigning sensibility, providing a bracing counterpoint to the vocals and lovely, searching instrumental narratives in their own right. Szlam’s work was the source material for the album’s visual aesthetic. Szlam’s visual creation for the album derives from sequences that echo lunar notions and photographic intervals that reverberate and resonate, evoking the oscillation of time. 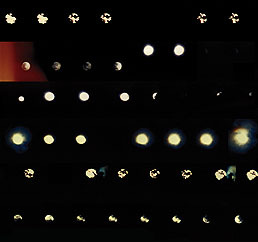 Using frames from various hand-processed 16mm filmstrips, Szlam created a lunar sequence that consitutes the album cover artwork. Inspired by the Lebanese educator Boutros Al-Bustani’s book Circumference of the Ocean, Mo7it Al-Mo7it signifies, in JIMH’s open and poetic interpretation, “Ocean of the Ocean.” The numeral 7 is pronounced like an h; all titles on the album are rendered in contemporary colloquial “mobile” Arabic (the transliterative characters used in Arabic phone texting). Jerusalem in My Heart at MAI from Villa Villa Nola on Vimeo. AUDIO CLIP "JERUSALEM IN MY HEART - Koll Lil-Mali7ati Fi Al-Khimar Al-Aswadi"
Jerusalem in My Heart’s Mo7it Al-Mo7it is out March 19 on Constellation Records.